Celebrate and congratulate a new wedding couple with this beautiful beach Wedding Congratulations greeting card. 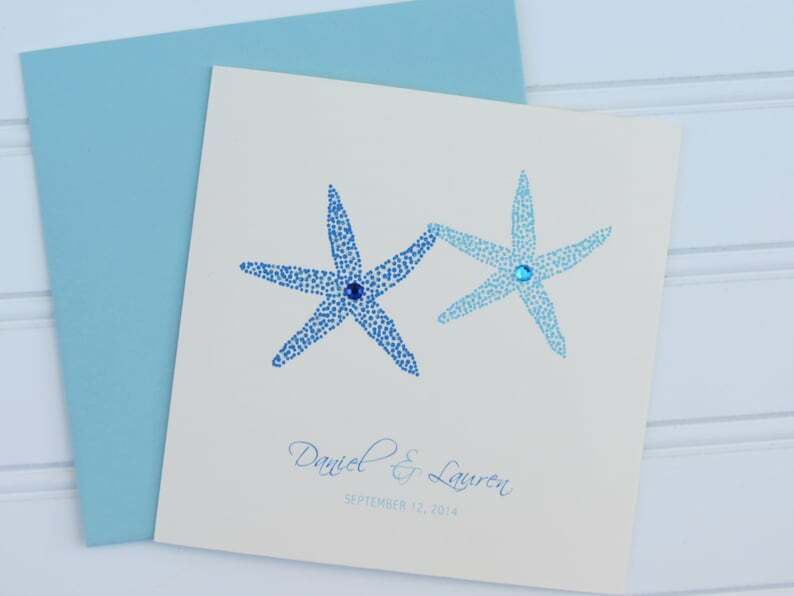 This card is completely customized and personalized with the names of both wedding parties on the front beneath an illustration of two beautiful starfish. Please leave the names and wedding date in the Notes section when you place your order. This is a great card for a couple that is having a beach or coastal destination wedding! The message on the inside of the card says, "Wishing you love, laughter and romance always...Congratulations!" This inside message can also be customized if you wish to deliver a different message. (The sample photo is in blue, but your card will print with ink in the color of your selection.) This card is square-shaped and measures 5.5” x 5.5” when folded as displayed on the listing photos. Your lovely card will be individually printed on high quality card stock in my home studio and also comes with a matching coral colored envelope, round colored envelope seal, and matching USPS Forever postage stamp.